Getting Mícheál Ó Súilleabháin to pen a laudatory comment might be regarded as something of a coup, but the bold Mickey may regret stamping his imprimatur on The Rolling Wave. For this is a veritable pig’s ear of an album, with no offence intended to our porcine friends. The cover pictures should give the game away, bearing, as it does, a reproduction of probably the worst painting ever created by Brian Vallely. 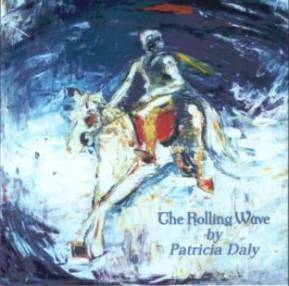 Patricia Daly is a notable harper and the leading force behind the Armagh Harpers’ Association and, as you might expect from this, the harp tracks are the most effective and enjoyable on The Rolling Wave. Her adroitness shines, for instance, on Lady Dillon where fiddler Gerry O’Connor (and it’s grand to see him returning to the fray) provides a notably strong melodic lead. However, the fact that most harpers also sing – Mary O’Hara, Máire Ní Chathasaigh and Grainne Yeats spring immediately to mind – does not make this a requirement. Let’s be blunt. Patricia Daly has the kind of voice which could act as a nuclear deterrent. As such, she contrives to make Gosford’s Fair Demesne seem an insalubrious option, loses the thread completely (and often the correct pitch) on The Road to Clady and just makes you want to push her into the water on Lough Erne’s Shore. However, the true depths are dredged on a rendition of The Mountains of Pomeroy which is so soporific that it sounds as though her co-singer, Gabriel McArdle, is about to nod off in the studio. This album is apparently supported by The Arts Council of Northern Ireland. It should have more sense. If you really want to know more, click here.